Extra random fact: my neighbors have a rooster in their front yard (yes, I live in the city) and I felt like this type of post needed a random picture. 2. I was a ballerina for 9 years and a basketball player for 10 years. They are REALLY different, but somehow they both worked for me - I think it's because I'm 5'10"? My dream was to be a ballet teacher, but then I started playing basketball in 7th grade and played through college. I am definitely a mediocre player (the WNBA is not in my future), but I love it. 3. I never thought that I would get married young (I was 22). My plan was to start my own company and maybe think about boys when I was 30. Then I met Eric. And my plans seemed silly. I am thankful now that I got married young; we have had so much fun together without having to think about having kids yet (You can read our love story here). 4. The best compliment you can give me is to tell me you think I'm funny. My husband told me that once and then he said he regretted it because I freaked out :) I love making people laugh. In college I performed in some sketch comedy performances and it was pretty wonderful. Now, I'm trying to think of something funny to write... but my humor can't be forced - it's all natural. Ha. 5. Organizing is one of my favorite pastimes. When I was in high school, my aunts would pay me to organize their closets. Seriously, I get giddy if I know I have a closet to organize. It just feeeeels so good. So there you have it. Thanks for letting me share! I love organization but I can't seem to stick with it. It always works out relationship-wise, doesn't it? Knowing you wouldn't change anything is a good feeling. A photo shoot?! I love that idea! My first thought was that picture was from H&ADoF2. Didn't you wear that dress then? 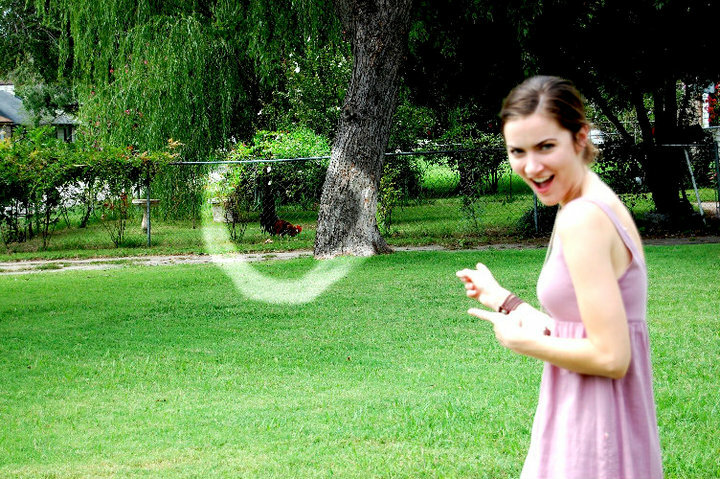 Second thought was that you had somehow managed to produce a Gandalf-sized smoke ring to encircle that rooster. Third thought was that I miss you. Gah.... I wish it was! Karrit actually took this pic and did that Gandalf thing - she might actually be the one of us that is a wizard, though she would be the least likely to be excited about it. Missss youuuu toooo! Come hang out with me! Hey, I think you are funny. Hyperventilating... best compliment ever! Ha! 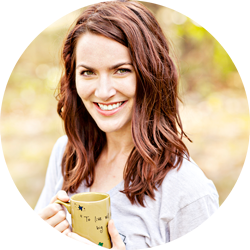 check my blog if you want and maybe we could follow each other on GFC and Bloglovin? I loved reading your 5 things! And married at 22? That sounds so young, but I think I was only 24 so I can't judge there :) and you ARE funny! Haha, thanks Kimmie! Now that I'm 26, 22 seems crazy young. Thankful it turned out to be a really good thing! I also have a hard time coming up with facts about myself, but once I start rolling them off it's hard for me to stop ;) I'm 5'7 but hopefully one day I will be 5'10 like you - you lucky girl! Isn't it funny how life always turns out differently than we expect - I honestly kind of thought I would never get married either! I really do wish I could come help you with your closet! I can tell you love organizing - I love your new craft space! It really is funny the way it turns out! Life has brought me different things than I expected, but it has been so much better than I thought! Thanks, Diana. So glad you're here! I REALLY want to get chickens! Actually, I just want fresh eggs, I don't want to take care of chickens, so I'm guessing it probably won't happen :) What's so crazy is that our neighbors don't even have chickens - just a rooster! I like the thirs fact! :) You have a great blog! I love reading posts like this. I also did 5 things. What an honor, Ada! You are the best! haha wow so different, ballerina and basketballer! well done though, your flexibility and coordination skills must be excellent, unlike mine!